‘Logical Framework’, or ‘logframe’, describes both a general approach to project or programme planning, monitoring and evaluation, and – in the form of a ‘logframe matrix’ – a discrete planning and monitoring tool for projects and programmes. Logframe matrices are developed during project/programme design and appraisal stages, and are subsequently updated throughout implementation while remaining an essential resource for ex-post evaluation. As a methodology, the ‘Logical Framework Approach’ (LFA) is a systematic, visual approach to designing, executing and assessing projects which encourages users to consider the relationships between available resources, planned activities, and desired changes or results. At its core is a theory of change management which presents the logical flow of causal outcomes between achievement of a project/programme’s activity targets, and the delivery of intended results. Logframes, to this end, enable planners to establish a hierarchy of objective or result statements – i.e. a development pathway – which articulate their best understanding of how change can be achieved. A logframe matrix (often simply called the ‘logframe’) serves to translate this broader LFA theory into action, and as a document forms the basis of an actionable work plan to guide implementation through the project/programme lifecycle. Logframe matrices assist directly in establishing the development pathway by which objectives will be reached, identifying the potential risks to achieving the objectives, establishing how outputs and outcomes might best be monitored and evaluated, presenting a summary of the activity in a standard format, and suggesting M&E activities during implementation. A wide range of logframe formats exist, varying between donors and organisations - as such, there is no standardised template (Levine, 2007:Annex 1). A generic logframe matrix is typically one formed around a 4 x 4 table. At minimum, four central categories, arranged horizontally by column, or vertically by rows, contain information on the project/programme’s Goal, Purpose, Activities, and Output. A Narrative Summary describing the event. Means of Verification(or ‘verification sources’) – the location of those sources of data required of the above indicators. A list of critical risks and Assumptions ( ‘hypotheses’) – those external factors which the evaluators believe may positively or negatively influence the events described by the narrative summary, including any external phenomena beyond the project/programme manager’s control. Only those concerns or anticipated opportunities which can actually be substantiated should be included. Additionally, baseline date, measurable milestones in the progress of an event, and/or target year/date are also commonly included. While an integral option within international development, LFA has also generated specific criticisms, most notably for a perceived rigidity in its approach as well as for its potential incompatibility with participatory assessments (wherein the priorities of vulnerable groups can often be overlooked by the external actors or local elites who take part in the logframe construction). In response, multiple variations on the core LFA option exist which seek to redress these weaknesses. For example, Goal Oriented Project Planning (GOPP), an instrument developed by the GTZ, seeks to strengthen the LFA’s participative dimension by placing emphasis on steps such as participation analysis, problems analysis and goals analysis. The Social Framework (SF) likewise provides additional space in its matrix for consideration of the range of different agents involved in the development intervention, while Outcome Mapping similarly places intentional emphasis on a pre-planning phase used to consider existing relationships and organisational processes relevant to the project/programme. In 2009 CAFOD successfully used DFID’s logframe template to apply for £610,000 to fund a project in Kenya and Zimbabwe called ‘Mitigating the impact of the economic downturn on vulnerable groups’. CAFOD and DFID subsequently used the logframe to monitor and evaluate the success of the project. Do not confuse logframes with ‘results frameworks’ – while the two tools share many similarities, the latter is more focused on articulating results than the former. Logframes are best used at an early stage in programme or project design. It is more difficult to use a logframe to review and/or restructure ongoing activities which were not designed using logframe principles and practices. Drafting logframes is also an ‘aid to thinking’ and a good way to involve an entire team at the design stage of a project. Adequate opportunity should be given to colleagues and key stakeholders to provide input to the process and production of a logframe. The logframe drafting process is an ideal opportunity to invite the entire team to take part in the project design stage, and time should be allocated to both staff and key stakeholders to provide input. In drafting a logframe, evaluators should first understand the context within which the project/programme will be implemented, take steps to ensure the perspectives of all stakeholders are addresses, and seek to balance any competing demands from donors and stakeholders. In considering the full range of assumptions and potential risks to include in the logframe matrix, a number of additional strategic tools, such as Problem and Objective Trees, SWOT and Stakeholder Analyses, and a Risk Matrix, can be particularly useful. Ensure that once the logframe is written, it does not simply just ‘sit on a shelf’ but is frequently reviewed and referred to during project implementation. It should be used to manage activities, drive work plans, assess progress, keep stakeholders aware of your plans and to monitor the overall progress of the project. Terms of Reference - End of Programme Independent Evaluation of DFID GPAF007 Programme: “Mitigating the impact of the economic downturn on vulnerable groups”. 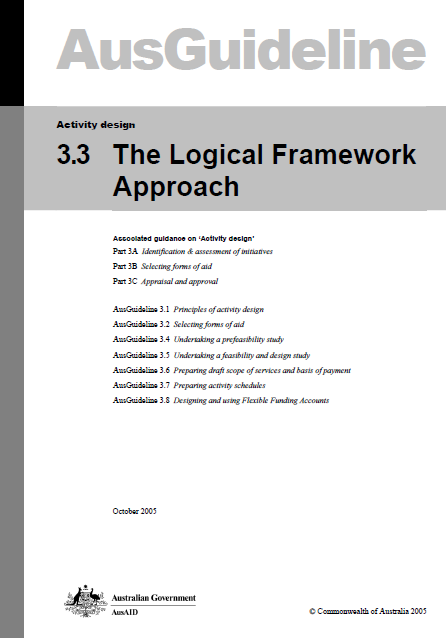 3.3 The Logical Framework Approach - AusGuideline. Activity design: Commonwealth of Australia. Guidance on Using the Revised Logical Framework - How to note. A DFID practice paper: Department for International Development (DFID). Aid Delivery Options PCM - Project Approach Guidelines - Project Cycle Management Guidelines (Vol. 1, pp. 158). Brussels: EuropeAid Cooperation Office, European Commission. Making a difference: M&E of policy research - ODI Working Paper 281. London: Overseas Development Institute. This paper aims to advance understanding on how to monitor and evaluate policy research, i.e. research that is undertaken in order to inform and influence public policy. Policy is defined very broadly to encompass both policy decisions and processes, including implementation. The Catholic Agency for Overseas Development (CAFOD) (2011). Mitigating the impact of the economic downturn on vulnerable groups. London, UK : Active Learning Network for Accountability and Performance in Humanitarian Action (ALNAP). Chambers, R., & Pettit, J. (n.d.). Logframe - A Critique. DFID. (2011). Guidance on Using the Revised Logical Framework. How to note. A DFID practice paper: Department for International Development (DFID). ECODE. (2011). Critical Study of the Logical Framework Approach in the Basque Country. Estudo de Cooperacion al Desarollo. Levine, C. J. (2007). Catholic Relief Services' (CRS) Guidance for Developing Logical and Results Frameworks. Baltimore: Catholic Relief Services. My director often talks about the good old days when the log frame approach was participatory, encouraged iteration and amendments and actually produced something that was useful for project implementers as well as those to which they are accountable. One tip he shared which I will always remember is to with the risks/assumptions column - arguably the most important part of the log frame (why on earth it doesn't appear in recent versions I have no idea). When facilitating the drafting of a log frame he would always ask the team one question to determine if something should go in the risks/assumptions column: Is there anything that the project can do to mitigate this risk or affect this assumption? If the project can do something, even the smallest of interventions to mitigate the risk then it does not qualify as a bona fide risk/assumption. It can only qualify if there is truly nothing that the project can do about it - it is completely out of their control and out of their influence.